OPI Unfor-Greta-Bly Blue is a sensational navy shimmer. Part of OPI’s Autumn/Winter 2012 Germany Collection; Unfor-Greta-Bly Blue is free from Formaldehyde, DBP and Toluene and is perfectly opaque in just two coats. The perfect winter shade this lusciously deep blue is infused with the perfect amount of shimmer for glamorous nails. 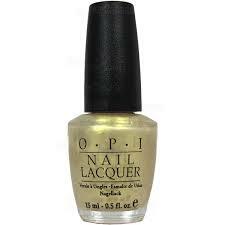 OPI is a world leader in nail polish, with exceptional formulas and fashionable shades that are rich and heavily pigmented making them long lasting and chip resistant.